"...and all will be revealed"
Charles' determination to find Fenton's notes — and the vital information on the plans and movements of the region's survivors they provide — has paid off, despite the risks involved. Now that he has Fenton's records, he needs only to evade the attention of Sander's gang and escape the district. He passes along the riverside edge of Fenton's cottage as he moves off. 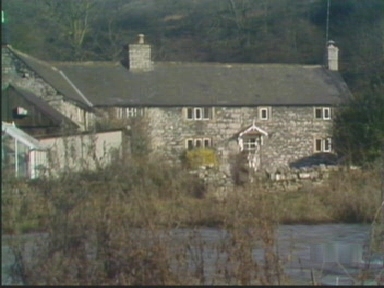 Description: 'Fenton's house' (previously seen from the other side during Charles' approach) is in reality Dean Cottage in the heart of the Monsal valley, located between the valley crossroads and the small parking area in the valley floor. Where is it? : This view of the house is from the far side of the river, looking back in the direction of the crossroads in the Monsal valley. Where's the best vantage point? : The sequence was filmed either from the river bridge (the side of which is visible in the photograph above) or from the far bank of the river. What about access? : The bridge is part of the public highway, and so is fully accessible (although a watch must be kept for occasional vehicles). The riverbank along which Charles walks is private property, as is the far side riverbank directly opposite. Anything else? 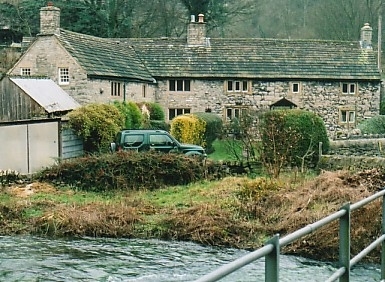 : As with all the Monsal sites, numerous other locations are nearby — including Jim and Sanders' barn and the road along which Charles cycles. As with the viaduct top, the bridge itself is a popular tourist spot, and can be a very busy area at "peak times". During quieter periods it is a stunningly beautiful and restful setting.